VIRGIN, BUT ACTUALLY SAYS WHO WAS HIS FATHER. 1: Jesus never said he was born of a virgin (read the New Testament). 2: Saint Paul, who wrote half of the books of the New Testament, contradicts the virgin birth: “Jesus was a descendant of David according to the flesh”. 3: Saint Mark and Saint John do not mention the virgin birth. 4: Sain Matthew and Saint Luke, who refer to a mystery in regards to Jesus’ birth, offer genealogies for Jesus that do not coincide with each other. Saint Matthew refers to several prophecies coming true in Jesus because the Jews believed in prophecies. 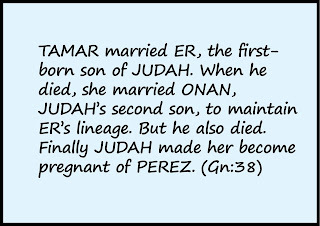 In his first chapter he refers to a prophecy regarding a virgin that gave birth to a son. 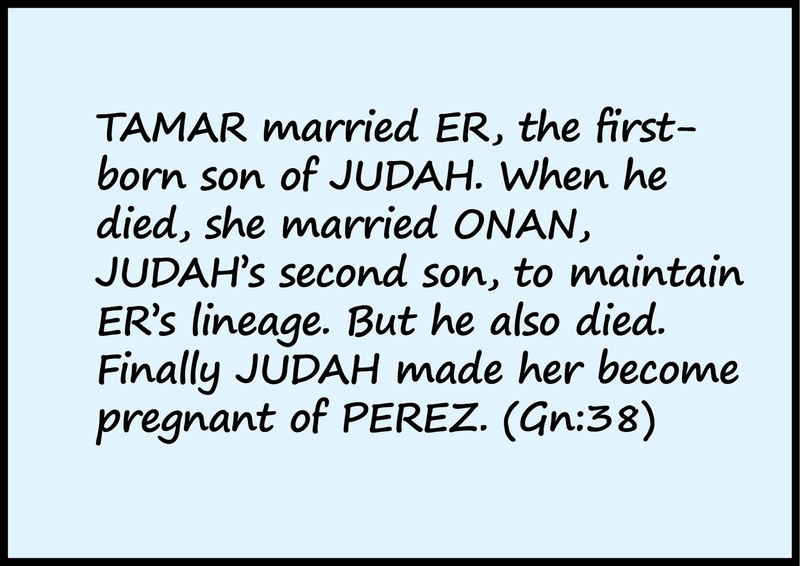 This is why, many centuries ago, the religious authorities assumed that Jesus was born of a virgin. However, these people ignored that Saint Matthew refers to a prophecy in Isaiah and that this prophet originally mentioned a young woman and not to a virgin. Saint Matthew mistranslated that word on purpose to make people assume that Jesus was born of a virgin. 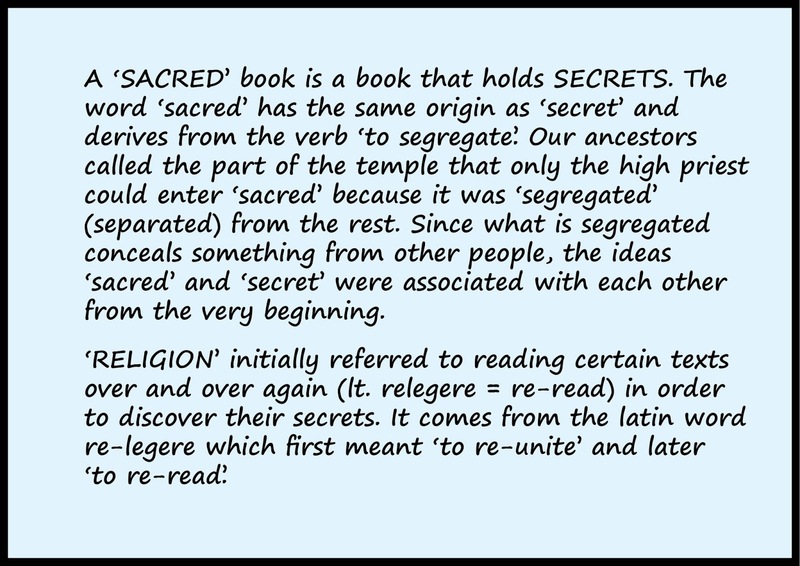 You have to realize that when his gospel appears, a long time after it was written, the religious authorities were no longer descendants of Jews, who were familiar with books that hold secrets, but of pagans, who were familiar with pagan ideas. One was that of ‘A god being born of a virgin’, another that of ‘A Messiah being born of a virgin’. 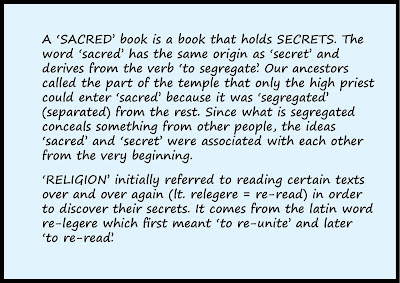 The Egyptians were familiar with the former idea while the Persians were familiar with the latter. To attract the pagans to Christianity the gospels associated Jesus with several miracles, because that was what pagans believed in. 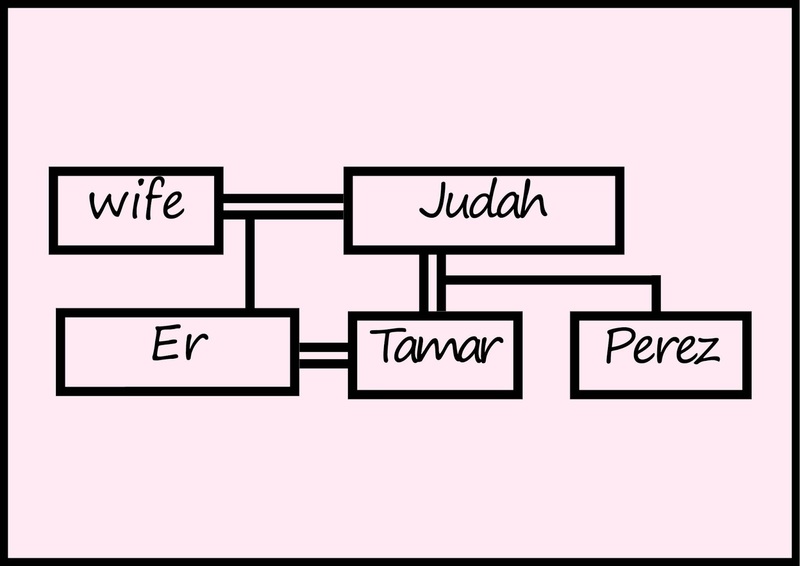 In regards to genealogies, you have to realize that because of extramarital relations some lineages are real while others are supposed. The person you think is your father is not necessarily your biological father. You can be sure of the female lineage of your mother, always from mother to daughter, but to be sure of the male lineage of your father, always from father to son, with each generation that you go back in time you have to make a DNA test. 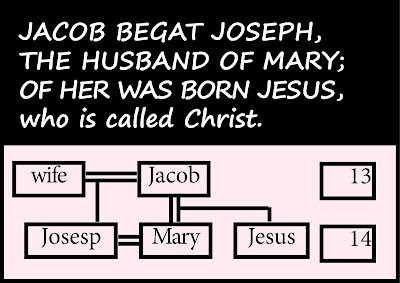 The Bible recognizes that difference by basing real lineages on the ‘father begot son’ principle and basing supposed lineages on formulas such as, “Cain knew his wife and she became pregnant and gave birth to” or “And Jesus was, as people believed, the son of Joseph, the son of Heli, etcetera” That not only means that people believed that Jesus was the son of Joseph, but also that they believed that Josepth was the son of Heli, etcetera. Saint Matthew and Saint Luke offer different genealogies because the former offers his true lineage and the latter his supposed lineage. Saint Matthew starts his genealogies for Jesus with Abraham and ends with Jesus. 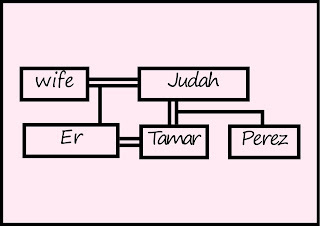 What is intriguing is that although it is based on the father begot son principle it ends with, “Jacob begot Joseph, the husband of Mary who gave birth to Jesus.” Also intriguing is that in this male lineage appear four women – Tamar, Rahab, Ruth and Batsheba – and when we consult the Old Testament we find that all had extramarital relations. This information prepares us for what we are going to discover about Mary. And the end of this genealogy Saint Matthew says, “So the amount of generations are: fourteen from Abraham to David, fourteen from David to the Babylonian deportation, and fourteen from the Babylonian deportation to Jesus. Saint Matthew obviously encourages us to divide these generations in three columns. 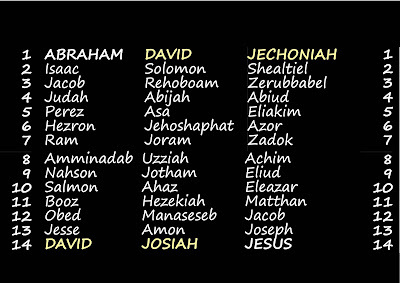 The traditional way to do so is the following: Abraham / David ; David / Josiah and Jechoniah / Jesus. 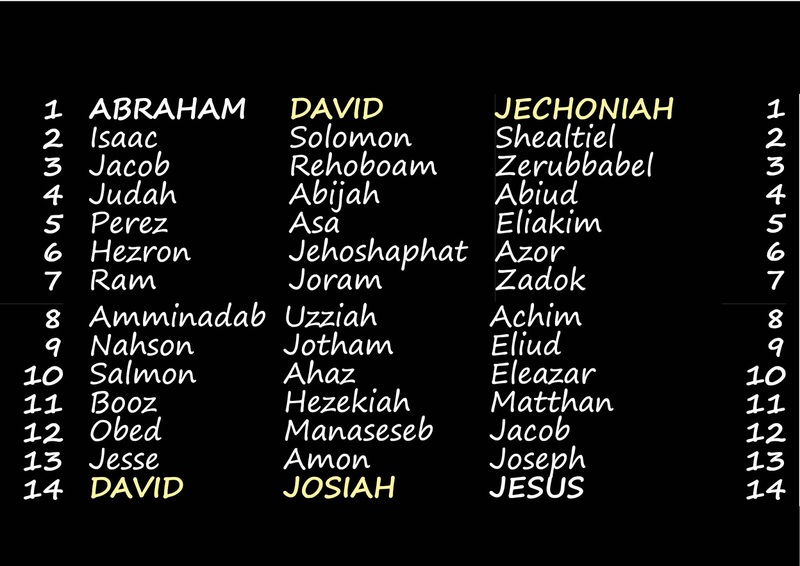 But this division is inconsistent because it repeats David in the second column, but not Josiah in the third column. 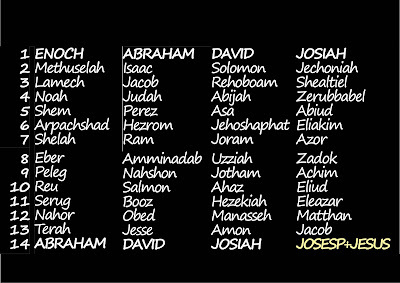 When we repeat Josías in the third column we see that there are already fourteen generations between him and Joseph, so if Josiah marks the deportation to Babylon and there are fourteen generation between the deportation to Babylon and Jesus, Joseph and Jesus form part of the same generation, which means that they were brothers, and that is possible if Jacob first had Joseph and later, when Joseph was an adult, had Jesus from Joseph’s wife Mary. The Jews believed that the Messiah would be a descendant of David. 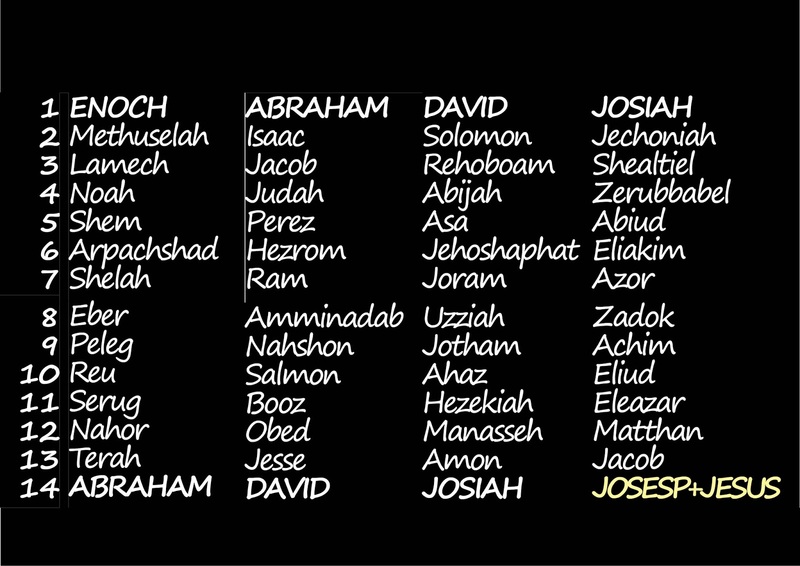 In case that Jesus was the son of Jacob, the genealogy in Saint Matthew makes sense as it demonstrates that Jesus was a descendant of David. 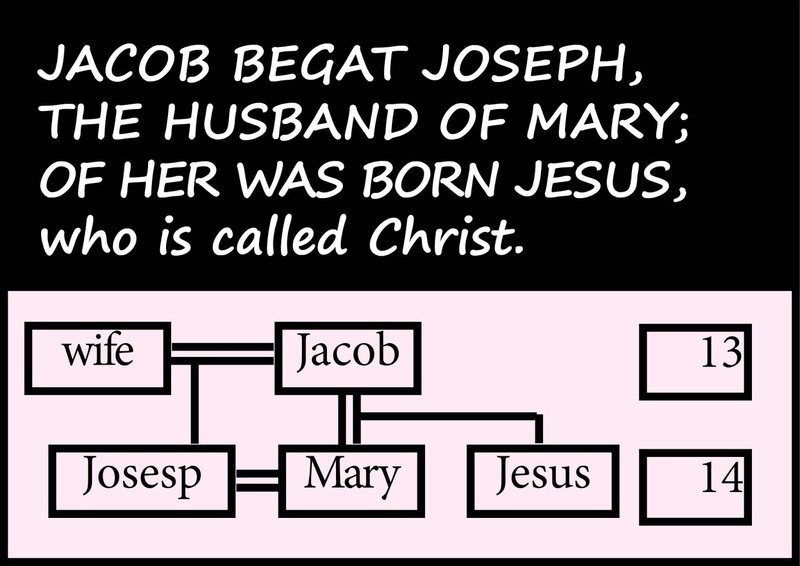 In case that Jesus was born of a virgin it makes no sense, because Jesus then had nothing to do with that lineage. عندما نتفكر في تطور الانسان نرى أن المجتمع الذي لا يعيش في انسجام كمجتمعنا ستكون النتيجة الحتمية أن يدمر نفسه. لقد حسن التكنولوجيا تدريجيا من فعالية الأسلحة - كأسلحة الدمار الشامل- و تمكننا و نحن نسبك قليلك من البشرية من التحكم في كمية هائلة و متزايدة من الموارد و هكذا يزيد التوتر بسن المجموعات المختلفة من البشر و بين البشر و الطبيعة. 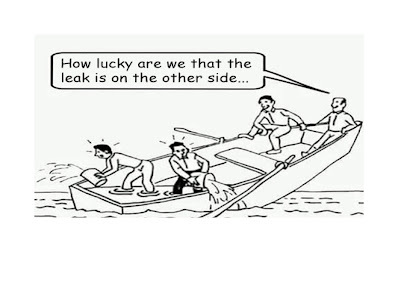 Wanneer ons oor die ontwikkeling van die mens bepeins, dan sien ons ‘n samelewing wat nie in harmonie woon nie, soos ons s’n, wat ten einde ons gaan vernietig. Tegnologie maak wapens wat altyd meer gesofistikeerd word. Dit het gelei tot tot massa vernietiging en dit veroosaak dat ‘n al hoe kleiner persentasie van die wêreld bevolking ‘n altyd groter persentasie van al die wêreld se beskikbare bronne inpalm, en dus ook dié spanning tussen die verskillende groepe mense verhoog, asook die mens en die omgewing. Terwyl ons intellektuele - wetenskaplikes, folosofie, politici en teoloë - dit ignoreer, Genesis wat die oorsprong van Judaïsme, Christendom en Islam is, erken dié werklikheid: 10 geslagte na die einde van harmonie (paradys) het one voorouers hulsef amper vernietig (die Groot Vloed). Om selfvernietiging te vermy moet ons onsself vra, waarom ons konflikte met ander mense en die omgewing het...en dan ook kyk na wat Genesis sê, dat ons voorouers amper hul eie einde veroorsaak het dur die “Verbode Vrugte” te eet. en dan vra, wat is die ‘vrug’. GIZATERIAK IKASI BEHAR DUEN IKASGAIRIK GARRANTZITSUENA. Gizateriaren garapenari buruzko gogoeta egiten dugunean, ikusten dugu gizartea ez dela harmonian bizi, eta azkenean autosuntsituko dela. Teknologiak gero eta arma sofistikatuagoak egiten ditu – gaur egun suntsitze masiboko armak ditugu – eta munduko populazioaren ehuneko gero eta txikiago batek baliabideen portzentai gero eta handiago bat eskuratzen duela; beraz, lagun-taldeen arteko tentsioa handitzen da, eta baita ere pertsonen ingurunearen artean. Bitartean, guru intelektualek –zientifikoek, filosofoek, teologoek – ez dira jabetzen honetaz, Genesiak, judaismoa, kristautasuna eta Islamaren jatorrian dagoena, errealitate hau onartzen du: hamar belaunaldi eta gero, harmonia amaitu zenean (Paradisua), gure arbasoak ia guztiz autsuntsitu ziren (Uholde Nagusia). Gure autosuntsiketa ekideteko gure buruei galdetu behar diegu zergatik besteekin eta gure ingurunearekin ditugun gatazkak eta Genesian esaten den moduan, nola gure arbasoek debekatutako fruitua jateagatik harmoniarekin bukatu zuten, hala galdetu beharko genuke zer den debekatuta fruitua. Когато рефлектираме над човешката еволюция, виждаме общество, което не живее в хармония и което неизбежно върви към своето самоунищожение. Технологията все повече усъвършенства оръжията - в днешно време разполагаме с оръжия за масово унищожение - и помага на все по-малък процент от населението на света да използва непрекъснато нарастващ процент от наличните ресурси, като така увеличава както напрежението между различните хора, така и между тях и тяхната околна среда. Докато нашата интелигенция - учени, философи, политици, теолози отричат това, Старият Завет, който е първоизточникът на юдаизма, христианството, и исляма разпознава тази реалност: 10 поколения след края на хармонията (рая) нашите предци почти напълно се самоунищожават (Великия Потоп). За да избегнем нашето самоунищожение, ние трябва да си зададем въпроса защо влизаме в конфликт с други хора и с околната си среда. И със Стария Завет, който ни разказва как нашите предци слагат край на хармонията, отхапвайки от забранения плод, също така трябва да си зададем въпроса, какво се има предвид под забранения плод. Quan reflexionem sobre l'evolució de la humanitat, veiem que una societat que no viu en harmonia, com la nostra, és finalment obligada a destruir-se a si mateixa. La tecnologia fa que les armes hagin de ser contínuament més sofisticades - avui en dia tenim armes de destrucció massiva - i permet que un percentatge cada vegada més petit de la població mundial, es pugui apropiar d'un percentatge cada vegada més gran de tots els recursos disponibles, el que fa augmentar la tensió entre els diferents grups de persones, i entre ells i el seu entorn. Mentre que els nostres intel·lectuals - científics, filòsofs, polítics, teòlegs - ignoren això, el Gènesi, que està en l'origen del judaisme, el cristianisme i l'Islam, reconeix aquesta realitat: 10 generacions després de posar fi a l'harmonia (el Paradís), els nostres avantpassats es van gairebé destruir ells mateixos (el Gran Diluvi). Per evitar la nostra autodestrucció ens hem de preguntar per què tenim conflictes amb els dames i amb el nostre entorn i, com que el Gènesi diu que els nostres avantpassats van posar fi a l'harmonia per menjar una fruita prohibida, també hauríem de preguntar-nos a que es refereix ,exactament, aquesta fruita prohibida. Když se zamyslíme nad vývojem lidstva, vidíme, že pokud společnost, nežije v harmonii (jako ta naše) je odsouzena k zániku. Technologie vytváří stále propracovanější zbraně - v současné době máme zbraně hromadného ničení - které umožňují stále menšímu procentu světové populace přivlastnit si stále větší procento ze všech dostupných zdrojů, čímž se zvyšuje napětí mezi různými skupinami lidí a zároveň mezi nimi a jejich prostředím. Zatímco naši intelektuálové - vědci, filozofové, teologové, politici - toto ignorují; Genesis, která je u zrodu judaismu, křesťanství a islámu, rozpoznává tuto realitu: 10 generací po ukončení harmonie (ráj), naši předkové téměř zcela zahubili sami sebe (Potopa světa). Aby se zabránilo našemu sebezničení musíme se ptát, proč máme konflikty s ostatními lidmi a s naším životním prostředím. Je to to samé jako se ptát, k čemu odkazuje zakázané ovoce, když Genesis říká, že naši předkové skoncovali s harmonií tím, že jej okusili. Når vi reflekterer over menneskehedens udvikling ser vi, at et samfund, der ikke lever i harmoni, som vores, ender med at ødelægge sig selv. Teknologi gør hele tiden våben mere avancerede - i dag har vi store mængder af masse-ødelæggelsesvåben - som muliggør at en stadig mindre procentdel af verdens befolkning kan tilegne sig stadig større procentdel af alle tilgængelige ressourcer, hvilket øger spændingen mellem de forskellige grupper af mennesker og mellem dem og deres miljø. Hvorimod vore intellektuelle - videnskabsfolk, filosoffer, politikere, teologer - ignorerer dette. Skabelsesberetningen som ligger til grund for jødedom, kristendom og islam, anerkender dette faktum: 10 generationer efter afslutningen af harmonien (Paradiset), ødelagde vore forfædre næsten fuldstændigt sig selv (Syndfloden). For at undgå selvdestruktion må vi spørge, hvorfor vi har disse konflikter med andre mennesker og med vort miljø. Ifølge Skabelsesberetningen, som siger, at vore forfædre satte en stopper for harmonien ved at spise en forbuden frugt, er dette er det samme som at spørge, hvad den forbudne frugt refererer til. Wanneer we nadenken over de evolutie van de mensheid zien we dat een samenleving die niet in harmonie leeft, zoals de onze, uiteindelijk gedoemd is om zichzelf te vernietigen. De technologie zorgt ervoor dat wapens voortdurend vernuftiger worden - tegenwoordig hebben we massavernietigingswapens - en ook dat een steeds kleiner percentage van de wereldbevolking zich een steeds groter percentage van alle beschikbare middelen toeëigent, waardoor de spanning tussen de verschillende groepen mensen en tussen hen en hun omgeving toeneemt. Terwijl onze intellectuelen - wetenschappers, filosofen, politici, theologen – dit over het hoofd zien, erkent Genesis dat aan de oorsprong van het jodendom, het christendom en de islam deze realiteit ligt: 10 generaties na een einde te maken aan de harmonie (het paradijs), vernietigen onze voorouders zichzelf bijna volledig (de zondvloed). Om onze zelfvernietiging te voorkomen moeten we ons afvragen waarom we conflicten hebben met de andere mensen en met onze omgeving. Genesis zegt dat onze voorouders een einde maakten aan de harmonie door het eten van een verboden vrucht. Dit is hetzelfde als vragen waarnaar de verboden vrucht verwijst. When we reflect upon mankind’s evolution we see that a society that doesn’t live in harmony, like our own, is bound to eventually destroy itself. Technology makes weapons become continually more sophisticated – nowadays we have weapons of mass-destruction – and enables an always smaller percentage of the world population to appropriate an always larger percentage of all available resources, thus increasing the tension between the different groups of people, and between them and their environment. Whereas our intellectuals – scientists, philosophers, politicians, theologians – ignore this, Genesis, which is at the origin of Judaism, Christianity and Islam, recognizes this reality: 10 generations after putting an end to harmony (Paradise), our ancestors almost completely destroyed themselves (the Great Flood). To avoid our self-destruction we must ask why we have conflicts with other people and with our environment, and with Genesis saying that our ancestors put an end to harmony by eating a forbidden fruit, that is the same as asking what the forbidden fruit refers to. KÕIGE OLULISEM ÕPPETUND, MIDA INIMKOND PEAKS ÕPPIMA. Kui me mõtiskleme inimkonna arengus näeme, et ühiskond, nagu meie, mis ei ela harmoonias hävitab ta lõpuks paratamatult ka iseenda. Tehnoloogia muudab relvad pidevalt keerulisemaks - tänapäeval on meil massilise hävituse relvad – ja võimaldab maailma elanikkonna alati väiksem osa omastada alati suuremat prontsenti kõigist olemasolevatest vahenditest, suurendades pingeid erinevate inimgruppide ja nende keskkondade vahel. Arvestades sellega, et meie intellektuaalid – teadlased, filosoofid, poliitikud, teoloogid - ignoreerivad seda, Genesis, mis seisab judaismi, kristluse ja islami alguses, tunnustab seda reaalsust: 10 põlvkonda pärast harmoonia lõppu (Paradiis), meie esivanemad on peaaegu täielikult hävitanud iseenda (Suur Veeuputus). Et vältida inimese enesehävituse peame küsima, miks meil on konflikte teiste inimeste ja meie keskkonnaga ning Genesisega mis räägib sellest, et meie esivanemad panid harmooniale lõpu süües keelatud vilja, mis on sama kui küsida, millele keelatud vili viitab. Kun mietimme yhteiskunnan kehitystä huomaamme, että yhteiskunta, mikä ei elä sopusoinnussa, kuten meidän yhteiskuntamme, on se lopulta tuomittu itsetuhoon. Teknologia edesauttaa entistä tehokkaampien aseiden kehityksen-nykyään meillä on joukkotuhoaseita- mikä tekee mahdolliseksi sen, että yhá pienempi osa maailman väestöstä hallitsee suurta osaa koko maailman resursseista mikä taas lisää jännitteitä eri ihmisryhmien välillä. Kun taas kaikki intellektuellit- tiedemiehet, filosofit, poliitikot, teologit ovat välinpitämättömiä asian suhteen, Luomiskertomus (Genesis) mikä liittyy juutalaisuuden, kristinuskon ja islamin alkuperään, tunnustaa seuraavan tosiasian:10 sukupolvea sen jälkeen kun" Harmonia". päättyi, esi-isämme kokivat joukkotuhon ("Vedenpaisumus"). Välttääksemme itsetuhon, meidän olisi hyvä kysyä miksi olemme ristiriidassa muiden ihmisten ja ympäristömme kanssa. Myös Luomiskertomuksessa kerrotun kielletystä hedelmästä nauttimisen ja sen seurauksena tapahtuneen Harmonian, Sovun, loppumiseen, voimme myös nyt kysyä, mihin kielletyllä hedelmällä viitataan, mitä sillä oikeastaan tarkoitetaan. Lorsque nous réfléchissons sur l'évolution de l'humanité, nous voyons qu'une société qui ne vit pas en harmonie, comme la nôtre, est finalement amenée à se détruire. La technologie fait que les armes deviennent sans cesse plus sophistiquées – aujourd’hui nous avons des armes de destruction massive – elle permet à un pourcentage toujours plus petit de la population mondiale de s'approprier un pourcentage toujours plus grand de toutes les ressources disponibles, augmentant ainsi la tension entre les différents groupes de personnes et entre eux et leur environnement. Alors que nos intellectuels – scientifiques, philosophes, politiciens, théologiens – ignorent ceci: la Genèse, qui est à l'origine du judaïsme, du christianisme et de l'islam, reconnaît cette réalité: 10 générations après avoir mis fin à l'harmonie (le paradis), nos ancêtres ce sont presque complètement détruits eux-mêmes (le déluge). Pour éviter notre autodestruction nous devons nous demander pourquoi nous avons des conflits avec les autres et avec notre environnement et comme la Genèse dit que nos ancêtres ont mis fin à l'harmonie en mangeant un fruit défendu, on peut aussi se demander ce qu' est exactement le fruit défendu. Quelle chance que le trou soit de l'autre côté. A LECCIÓN MÁIS IMPORTANTE QUE A HUMANIDADE TEN QUE APRENDER. Cando reflexionamos sobre a evolución da humanidade, vemos que unha sociedade que non vive en harmonía, coma a nosa, é finalmente obrigada a destruírse. A tecnoloxía fai armas continuamente máis sofisticadas - hoxe en día temos armas de destrución masiva - e permite a unha porcentaxe sempre menor da poboación mundial ,apropiarse dunha porcentaxe sempre máis grande de todos os recursos dispoñibles, aumentando así a tensión entre os distintos grupos de persoas e entre eles e o seu medio ambiente. Tendo en conta que os nosos intelectuais - científicos, filósofos, políticos, teólogos - ignorar esto, o Génesis, que está na orixe do judaísmo, o cristianismo eo islamismo, recoñece esta realidade: 10 xeracións despois de poñer fin á harmonía (Paraíso), os nosos antepasados case se autodestrúen por completo (o Gran Diluvio). Para evitar a autodestrución, debemos preguntar por que temos conflitos coas outras persoas e co medio ambiente e igual que o Génesis di que os nosos antepasados puxeron fin á harmonía por comer un froito prohibido, teriamos que preguntarnos a que se refire exactamente o “froito prohibido”. DIE WICHTIGSTE LEHRE, DIE DIE MENSCHHEIT LERNEN MUSS. Wenn wir über die Evolution der Menschheit nachdenken sehen wir, dass eine Gesellschaft die nicht in Harmonie lebt, wie unsere, sich schließlich selbst zerstört. Durch Technologie werden Waffen ständig anspruchsvoller - heute haben wir Waffen der Massenvernichtung - und ein immer geringerer Anteil der Weltbevölkerung eignet sich einen immer größeren Prozentsatz aller verfügbaren Ressourcen an. Damit steigt die Spannung zwischen den verschiedenen Gruppen von Menschen und ihrer Umwelt. Während unsere Intellektuellen - Wissenschaftler, Philosophen, Politiker, Theologen – dieses ignorieren, erkennt Genesis, am Ursprung des Judentum, Christentum und Islam, diese Realität: 10 Generationen nach dem Ende der Harmonie (Paradies) haben unsere Vorfahren sich fast vollständig zerstört (die Sintflut). Um unsere Selbstzerstörung zu vermeiden, müssen wir uns fragen, warum wir Konflikte mit anderen Menschen und mit der Umwelt haben, und da Genesis sagt, dass unsere Vorfahren ein Ende der Harmonie gesetzt haben, durch den Verzehr einer verbotenen Frucht, ist das die gleiche Frage: Was ist die verbotene Frucht? ΤΟ ΣΗΜΑΝΤΙΚΟΤΕΡΟ ΜΑΘΗΜΑ ΠΟΥ ΠΡΕΠΕΙ ΝΑ ΛΑΒΕΙ Η ΑΝΘΡΩΠΟΤΗΤΑ. Όταν αναλογιζομαστε την εξέλιξη του ανθρώπινου γένους, διαπιστωνουμε ότι η κοινωνία, η οποία δεν ζει σε αρμονία ("κανονικότητα"), όπως η δική μας (η προσωπική αρμονία), έχει εκ των πραγμάτων αυτοκαταστροφικες τάσεις. Η τεχνολογία φτιάχνει όπλα κατ' εξακολουθηση, γίνεται πιο εξεζητημενη: -στις μέρες μας έχουμε στρατό μαζικής καταστροφής -που δίνει την δυνατότητα σε ένα όλο και μικρότερο ποσοστό του παγκόσμιου πληθυσμού να οικειοποιηθει ένα όλο και μεγαλύτερο ποσοστό διαθέσιμων πηγών, έτσι αυξάνεται η ένταση ανάμεσα στις διάφορες ομάδες ανθρώπων και του περιβάλλοντός τους. Γι αυτό το λόγο, οι διανοουμενοι- οι επιστήμονες, οι φιλοσοφοι, οι πολιτικοί, οι θεολογοι- το αγνοούν, η Γένεση που προέρχεται από τον Ιουδαισμο, ο Χριστιανισμος και το Ισλάμ αναγνωρίζουν αυτήν την πραγματικότητα: 10 επόμενες γενεές βάζουν ένα τέλος σε αυτή την αρμονία (Παράδεισος), οι προγονοι μας κατεστρεψαν σχεδόν ολοκληρωτικά τον εαυτό τους (ο μεγάλος κατακλεισμος). Για να αποφύγουμε την αυτοκαταστροφη μας πρέπει να διερωτηθουμε γιατί έχουμε συγκρούσεις με τους γύρω μας και με το περιβάλλον μας και με την Γενεση λέγοντας ότι οι προγονοι μας (εννοώντας τους πρωτοπλαστους) έδωσαν τέλος στην αρμονία τρώγοντας τον απαγορευμένο καρπό, που είναι το ίδιο σα να ρωτά κάνεις που παραπέμπει ο απαγορευμενος καρπός. "Πόσο τυχεροί είμαστε που η ρωγμή είναι από την άλλη μεριά...."
כאשר אנו מסתכלים אחורה על הסטוריית התפתחות האדם ואבולוציית הדורות השונים של האנושות, משתקפת לעיננו תמונה של חברה אשר אינה חיה בהרמוניה, עד ימים אלה ממש. חברה שמועדת להרס עצמי בסופו של דבר. הטכנולוגיה הופכת בהתמדה כלי נשק למתוחכמים יותר- כיום קיימים כלי נשק להשמדה המונית אשר מאפשרים לאחוז קטן מאוד מאוכלוסיית העולם לנכס לעצמו אחוז גדול מאוד של המשאבים השונים הזמינים על כדור הארץ כולו. בכך, גדלים המתחים בין קבוצות שונות באוכלוסייה, ובין בני האדם לסביבתם. בריאת העולם שמקורה ביהדות, בנצרות ובאיסלאם, מנכחת מציאות זו עוד מאז: עשרה דורות לאחר קץ גן העדן (סיפור אדם וחווה), שהוא בעצם סמל לקץ ההרמוניה, אבותינו כמעט הביאו לסוף האנושות (המבול הגדול). על מנת למנוע את ההרס העצמי שלנו כחברה, אנו מוכרחים לשאול את עצמינו מאין נובעים הקונפליקטים שלנו עם אחרים ועם סביבתנו. וכאשר אנו למדים מספר בראשית כי אבותינו שמו קץ להרמוניה בכך שטעמו מהפרי האסור, אז זה בעצם באותה המידה לשאול את עצמינו, מהו בעצם אותו פרי אסור? Cuando riflettiamo sull’evoluzione dell’umanità, vediamo che una società che non vive in armonia, come la nostra, alla fine è destinata a distruggere se stessa. La tecnologia crea armi sempre piú sofisticate – oggi abbiamo armi di distruzione di massa – e permette che una sempre minore percentuale della popolazione mondiale si appropridi una sempre magagiore percentuale delle risorse disponibili, aumentando così la tensione fra diversi gruppi umani, così come fra loro e il loro ambiente. Mentre gli intellettuali – scienziati, filosofi, politici, teologi – lo ignorano, la Genesi, che è all’origine dell’ Ebraismo, dell Cristianità el dell’Islam, riconosce questa realtá: 10 generazioni dopo aver messo fine all’armonia (Paradiso), i nostri antenati hanno quasi completamente distrutto se stessi (Diluvio Universale). Per evitare la nostra autodistruzione, dobbiamo chiederci perché abbiamo conflitti con gli altri e con il nostro ambiente circostante, e quando la Genesi racconta che i nostri antenati misero fine all’armonia mangiando un frutto proibito, varrebbe la pena chiedirsi a che cosa si riferisce l’espressione ‘fruto proibito’. Адам баласы үйрөнө турган эң маанилүү сабак. Биз адам баласын өнүгүүнө көз чаптырганда, гармонияда жашабаган биздин коом барып-барып бир күнү өзүн-өзү талкалап бүтөрү шексиз. Техниканын өнүгүшү менен курал-жарактардын акыркы түрлөрү жасалып чыгып атат, учурда биз массалык жоготууга алып келүүчү куралдарга ээбиз, бел деген дүйнөдөгү элдин аз проценти колдогу ресурсттардын көбүн которуп иштетүүдөдегенди билдирет. Натыйжада, ар түрдүү элдин топторунда, айлана-чөйрөсүндө, табиятында болуп көрбөгөндөй түйүктөрдү жаратууда. Учурунда, биздин интеллектуалдар – окумуштуулар, философтор, политиктер, теологдор булл абалды танып жатышса – Иудаизм, христиан, ислам, диндеринин жаралуусунда келтирген ал абалды: Гармония бүткөндөн кийин 10 уругу (Жаннат) биздин ата-бабаларызбыз толугу менен өздөрүн кыйратканын (Улуу суу каптоо) танбай эле келе жатышат. Биз өзүбүздүн кыйрообузду алдын алуу үчүн, ата-бабаларыбыз алманы татып, гармонияны жок кылган, деп айтуудан мурун, төмөнкү суроону өзүбүзгөберишибиз керек, эмне үчүн биз башка уллуттар, айлана-чөйрө карама – каршылыктар келип чыгуу менен аягында эмнеге алып келет? VISSVARĪGĀKĀ MĀCĪBA, KAS CILVĒCEI IR JĀIEMĀCĀS. Kad mēs atskatāmies uz cilvēces attīstību, mēs redzam sabiedrību, kura nav dzīvojusi līdzsvarā, tā pat kā mēs tagad. Tā virzās uz mērķtiecīgu pašiznīcināšos, kas agrāk vai vēlāk notiks. Mūsdienu tehnoloģiju laikmets nodrošina nepārtrauktu ieroču attīstību. Mums ir pieejami masu iznīcības ieroči, kas nodrošina iespēju arvien mazākai cilvēku saujiņai piesavināties arvien lielāku daļu no visiem pieejamajiem resursiem, kas palielina saspīlējumu starp dažādām cilvēku grupām un starp tām un apkārtējo vidi. Tomēr mūsu inteliģence - zinātnieki, filosofi, politiķi, teologi, ignorē šo Pirmo Mozus grāmatu, kas ir sākums Jūdaismam, Kristietībai un Islāmam, lai gan atzīst šo patiesību: 10 paaudzes pēc cilvēku izraidīšanas no Ēdenes dārza, mūsu senči gandrīz pilnībā iznīcināja paši sevi (Lielie grēku plūdi). Lai izvairītos no pašiznīcības, mums jājautā, kāpēc mēs konfliktējam ar citiem cilvēkiem un vidi mums apkārt, un Pirmo Mozus grāmatu, kas mums stāsta par mūsu senčiem, kuri iznīcināja Paradīzi, apēdot aizliegto augli. Tas ir tas pats, kā tagad mēs jautājam, kas ir šis aizliegtais auglis, bet nemākam to raksturot. Kai mąstome apie žmonijos evoliuciją, matome visuomenę, kuri negyvena harmonijoje ir ilgainiui atsiduria ties savinaikos riba. Technologijos kuria vis sudėtingesnius ginklus – šiandien jie skirti ir masiniam naikinimui – ir įgalina mažesnį procentą pasaulio gyventojų valdyti didesnę dalį visų įmanomų išteklių. Todėl vis stipriau auga įtampa tarp skirtingų žmonių grupių bei tarp žmonių ir jų aplinkos. Tuo tarpu mūsų intelektualai – mokslininkai, filosofai, politikai, teologai – tai ignoruoja. Pradžios knyga, kurioje slypi Judaizmo, Krikščionybės ir Islamo šaknys, leidžia pažinti šią realybę: atėjus harmonijos (Rojaus) pabaigai, mūsų protėviai beveik visiškai save sunaikino (Didysis Tvanas). Kad išvengtume savidestrukcijos, privalome klausti, kodėl patiriame konfliktus su kitais žmonėmis bei savo aplinka, Pradžios knygoje rašoma, kad harmoniją mūsų protėviai sugriovė paragavę uždrausto vaisiaus, taigi, reikia klausti,ką reiškia uždraustasis vaisius. Meta nirriflettu fuq l-evoluzzjoni ta l-umanita', naraw socjeta li ma tghix f'armonija, bhal dik taghna, li hija marbuta li teqred lilha nnifisa. It-teknologija tohloq armi, li eventwalment huma dejjem iktar sofistikati - illum il-gurnata ghadna armi li jeqirdu il-massa - u jippermettu persentagg dejjem izghar tal-popolazzjoni dinjija li percentwali dejjem akbar tar-rizorsi kollha disponibbli xierqa, biex b'hekk tizdied it-tensjoni bejn gruppi differenti ta' nies, bejniethom u l-ambjent taghhom. Billi l-intelletwali taghna - xjentisti, filosofi, politikanti, teologi - jinjoraw dan, il-Genesi, li hija l-origini tal-Gudizmu, Kristjanezmu u l-Islam, tirrikonoxxi din ir-realta': ghaxar generazzjonijiet wara tmiem ta l-armonija (Genna), l-antenati taghna, qerdu lilhom infushom kompletament (l-Gharqa il-Kbira). Biex nevitaw il-qerda taghna nfusna, ghadna nistaqsu ghaliex ghadna il-kunflitti ma l-ohrajn u ma' l-ambjent taghna, u bil-Genesi tghidilna li l-antenati taghna temmew l-armonija meta kielu mil-frotta projbita, dan huwa l-istess bhal meta nistaqsu xinhu il-frott projbit li jigi rreferut. Når vi ser på menneskehetens utvikling, ser vi at samfunn som ikke lever i harmoni slik som oss, vil utslette seg selv. Teknologi gjør våpen stadig mer sofistikerte – i dag har vi masseødeleggelsesvåpen – og gjør det mulig for en stadig mindre del av verdens befolkning å tilrane seg en stadig større del av tilgjengelige ressurser, slik at både spenningen mellom ulike folkegrupper og mellom mennesker og miljøet øker. Mens intelligentsiaen – vitenskapsmenn, filosofer, politikere og teologer – overser dette, anerkjenner jødedommen, kristendommen og islam denne realiteten: Ti generasjoner etter harmoniens (Paradis) slutt ble våre forfedre nærmest utryddet (Syndefloden). For å unngå selvutslettelse må vi spørre oss selv hvorfor vi har konflikter med andre mennesker, med miljøet og med Skapelsesberetningen, der det står at forfedrene våre satte en stopper for harmoni ved å spise den forbudne frukt. Så må vi spørre oss hva den forbudne frukt refererer til. Kiedy zastanawiamy się nad ewolucją ludzkości widzimy, że społeczeństwa, które nie żyją w zgodzie, takie jak nasze, sa na drodze do samo-zniszczenia. Technologia sprawia, że ​​broń nieustannie staje się bardziej zaawansowana - w dzisiejszych czasach mamy broń masowego rażenia. Umożliwia to sytuację, w której coraz mniejszy procent ludności świata zarzadza coraz większym udziałem wszystkich dostępnych zasobów, tym samym zwiększajac napięcie między różnymi grupami ludzi, jak i między nimi a ich środowiskiem naturalnym. Podczas gdy nasi intelektualiści, naukowcy, filozofowie, politycy, teologowie, ignoruja to - księga Genesis, która jest u początków judaizmu, chrześcijaństwa i islamu, rozpoznaje tę rzeczywistość: 10 pokoleń po położeniu kresu harmonii (Raj), nasi przodkowie niemal całkowicie ulegli samozniszczeniu (Wielka Powódź). Aby uniknąć naszej samozagłady, musimy zapytać, dlaczego mamy konflikty z innymi ludźmi oraz ze środowiskiem, a także z Genesis która mówi, że nasi przodkowie położyli kres harmonii jedząc zakazany owoc, co jest jednoznaczne z pytaniem do czego odnosi się Zakazany Owoc. Quando reflexionamos sobre a evolução da humanidade, vemos que uma sociedade que não vive em harmonia, como a nossa, está finalmente destinada a destruir a si mesma. A tecnologia faz com que as armas sejam continuamente mais sofisticadas - hoje em dia nós temos armas de destruição em massa - e temos consciência de que uma porcentagem cada vez menor da população mundial é dono de uma porcentagem cada vez maior de todos os recursos disponíveis; aumentando assim a tensão entre os grupos diferentes de pessoas, entre eles e seu entorno. Enquanto isso nossos intelectuais - cientistas, filósofos, políticos, teólogos - ignoram isso, o Gêneses , que está na origem do Judaísmo, do Cristianismo e do Islã reconhece esta realidade: 10 gerações depois de por o fim na harmonia (o Paraíso), nossos antepassados se auto destruíram quase por completo (o Dilúvio Universal). Para evitar nossa autodestruição deveríamos desejar saber porque nós temos conflitos com o outro, com nosso entorno e nosso ambiente; e como nos explica Gênese como nossos antepassados acabaram com a harmonia para comer uma fruta proibida, seria necessário saber a que se referem exatamente a fruta proibida. Russian САМЫЙ ВАЖНЫЙ УРОК, КОТОРОЕ ЧЕЛОВЕЧЕСТВО ДОЛЖНО ВЫУЧИТЬ. Когда мы размышляем об эволюции человечества, мы видим, что общество, которое не живёт в Гармонии, как наше, в конечном счёте приговорено к самоуничтожению. Технология делает оружия все более изощрёнными- ныне мы имеем оружие массового уничтожения- и это даёт возможность всегда меньшему проценту населения мира ассигновать всегда больший процент всех имеющихся ресурсов, тем самым увеличивая напряжённость между различными группами людей. В то время как наша интелигенция- учёные, философы, политики, богословы- игнорируют это, Бытие, которое интерпретирует Иудаизм, Христианство и Ислам, признаёт эту реальность: 10 поколений спустя после прекращения гармонии( Рая), наши предки почти полностью Сами разрушили всё( Великий Потоп). Чтобы избежать наше самоуничтожение мы должны спросить, почему у нас возникают конфликты с другими людьми и с окружающей средой и Бытие говорит, что наши предки положили конец гармонии, съев запретный плод, мы должны спросить самих себя к чему нас приведёт в конце концов то, что мы делаем. САМЫЙ ВАЖНЫЙ УРОК, КОТОРОЕ ЧЕЛОВЕЧЕСТВО ДОЛЖНО ВЫУЧИТЬ. Когда мы размышляем об эволюции человечества, то мы видим, что общество, которое не живёт в гармонии, как наше, в конечном счёте приговорено к самоуничтожению. Технология позволяет делать оружие все более изощрённым – сегодня у нас есть оружие массового уничтожения, и это даёт возможность той части населения земли, которая находится всегда в меньшинстве, присваивать себе всегда большую часть доступных ресурсов, таким образом увеличивая напряжение между разными группами людей, а также между ними и их окружающей средой. В то время как наша интелигенция – учёные, философы, политики, богословы – игнорируют это, Бытие, которое интерпретирует Иудаизм, Христианство и Ислам, признаёт эту реальность: 10 поколений спустя после того, как был положен конец гармонии (Раю), наши предки почти полностью уничтожили себя (Великий Потоп). Чтобы избежать нашего самоуничтожения, мы должны задаться вопросом, почему у нас возникают конфликты с другими людьми и с окружающей средой? Бытие говорит, что наши предки положили конец гармонии, съев запретный плод. Это равнозначно тому, чтобы спросить себя: что подразумевает под собой запретный плод? НАЈВАЖНИЈА ЛЕКЦИЈА, КОЈУ ЧОВЕЧАНСТВО МОРА ДА НАУЧИ. Када размишљамо о еволуцији човечанства, видимо да је друштво, које не живи у хармонији, као што је наше, на крају осуђено на самоуништење. Технологија нам омогућава да правимо истанчаније оружје – данас имамо оружје за масовно уништавање, и то даје могућност делу становништва, које се налази у мањини, да присвоји већи део доступних ресурса, појачавајући на тај начин напетост између различитих група људи, као и између њих и околине. Док наша интелиганција – научници, филозофи, политичари, богослови – игноришe то, Постојање, које интерпретира Јудаизам, Хришћанство и Ислам, признаје ту реалност: 10 генерација након што је стављена тачка на хармонију (Рај), наши преци су скоро у потпуности уништили себе (Велики Потоп). Да би се избегло самоуништење, морамо да се запитамо зашто настају сукоби изљеђу људи и у околини? Постојање говори, да су наши преци ставили тачку на хармонију, након што је поједен забрањени плод. То је исто као кад бисмо се запитали: шта се подразумева под тиме «забрањени плод»? Keď sa pozrieme späť na vývoj ľudského pokolenia, zistíme jednu vec. Ľudská spoločnosť ktorá nežije harmonicky, presne tak ako tá naša, je nutne odsúdená zničiť samú seba. Technológia prináša stále sofistikovanejšie zbrane - zbrane hromadného ničenia. Navyše umožňuje stále menšiemu percentu ľudskej populácie privlastniť si stále väčší podiel všetkých dostupných zdrojov a bohatstva Zeme. Tým pádom napätie medzi jednotlivými skupinami ľudí neustále rastie, ako aj napätie medzi ľuďmi a ich životným prostredím. Kým intelektuáli našej spoločnosti – vedci, filozofi, politici a teológovia celkom ignorujú tento fakt, kniha Genezis, ktorá stojí na počiatku židovstva, kresťanstva a aj islamu, ho rozpoznáva jasne: Desať generácií potom, čo naši predkovia ukončili mier a harmóniu na Zemi (raj), takmer celkom zničili samých seba (veľká potopa). Aby sme sa vyhli rovnakému osudu, musíme sa pýtať prečo máme neustále konflikty s inými ľuďmi a so životným prostredím. A, berúc na vedomie čo hovorí Genesis - že naši predkovia ukončili harmóniu tým, že „jedli zakázané ovocie“, pýtať sa, čo vlastne „zakázané ovocie“ znamená. Cuando reflexionamos sobre la evolución de la humanidad, vemos que una sociedad que no vive en armonía, como la nuestra, está finalmente destinada a autodestruirse. La tecnología hace que las armas sean continuamente más sofisticadas - hoy en día tenemos armas de destrucción masiva - y permite a un porcentaje cada vez más pequeño de la población mundial apropiarse de un porcentaje cada vez mayor de todos los recursos disponibles, lo que aumenta la tensión entre los diferentes grupos de personas, y entre ellos y su entorno. Mientras que nuestros intelectuales - científicos, filósofos, políticos, teólogos - ignoran esto, el Génesis, que está en el origen del judaísmo, el cristianismo y el Islam, reconoce esta realidad: 10 generaciones después de poner fin a la armonía (el Paraíso), nuestros antepasados se autodestruyeron casi por completo (el Gran Diluvio). Para evitar nuestra autodestrucción debemos preguntarnos por qué tenemos conflictos con los demás y con nuestro entorno y al igual que el Génesis cuenta como nuestros antepasados pusieron fin a la armonía por comer una fruta prohibida, cabría preguntarse a qué se refiere exactamente la fruta prohibida. När vi reflekterar över mänsklighetens utveckling, ser vi ett samhälle som inte lever i harmoni - liksom vårt eget, och eventuellt kommer att förstöra sig självt. Teknologin gör vapen ständigt mer sofistikerade – idag har vi vapen för massförstörelse – och gör det möjligt för en allt mindre del av världens befolkning att tillägna sig en allt större andel av alla tillgängliga resurser, vilket ökar spänningen mellan olika grupper av människor, och mellan dem och deras miljö. Medan våra intellektuella – vetenskapsmän, filosofer, politiker och teologer – ignorerar detta, erkänner Genesis, som är ursprunget till judendomen, kristendomen och islam, denna verklighet: 10 generationer efter att våra förfäder satte stopp för harmoni (paradiset), förstörde de nästan helt sig själva (den stora översvämningen). För att undvika vår självförstörelse måste vi fråga oss varför vi har konflikter med andra människor och med vår miljö, och med Genesis säga att våra förfäder satte stopp för harmoni genom att äta förbjuden frukt. Det är detsamma som att ställa oss frågan vad den förbjudna frukten står för. İnsanoğlu evrimine göz attığımızda, toplumun uyum içinde yaşamadığını görüyoruz. Tıpkı bizdeki gibi, eninde sonunda kendi kendini yok etmeye mahkum. 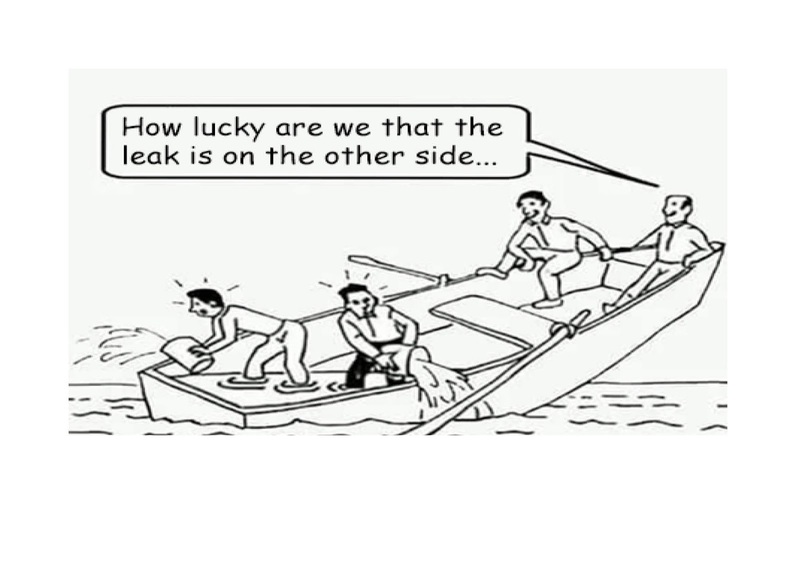 Teknoloji, silahları günden güne daha komplike bir hale getiriyor ve mevcut tüm kaynakların her zaman daha büyük bir yüzdesini, dünya nüfusunun küçük bir kısmına sağlıyor - bu günlerde kitle imha silahlarımız bile mevcut. Böylece farklı insan gruplarının, kendi aralarında ve çevreleri arasındaki gerilimin artmasını sağlıyor. Oysa bizim aydınlarımız - bilim adamları, filozoflar, politikacılar, teologlar - Yahudilik, Hıristiyanlık ve İslam'ın kökeni olan bu Genesis'i (İncil'in ilk kitabı) görmezden gelirken, şu gerçeği tanırlar: 10 jenerasyon bu uyuma bir son koyduktan sonra (Cennet), atalarımız kendilerini neredeyse tamamen yok etmişlerdir (Büyük Tufan). Bizlerin, gerçekleşen bu öz yıkımı engelleyebilmek için, diğer insanlarla ve çevremizle ve Genesis'in(İncil'in ilk kitabı) atalarımızın yasak meyveyi yiyerek bu uyuma son verdiğini söylemesiyle neden anlaşmazlığa düştüğümüzü sorgulamamız gerekir, bu durum aslında yasak meyvenin neyi temsil attiğini sorgulamak ile aynı şey sayılabilir. Коли ми розмiрковуемо про еволюцiю людства, то бачимо, що суспiльство, яке не живе в гармонii, як наше, в кiнцi кiнцiв засуджено до самознищення. Сучаснi технологii дозволяють виробляти зброю все бiльше витонченною - сьогоднi у нас э зброя массового знищення i це даэ можливiсть тiй частинi населення землi, яка завжди знаходиться у меншостi, завжди присвоювати собi бiльшу частину доступних ресурсiв, таким чином збiльшуючи напругу мiж рiзними групами людей, а також мiж ними та iхнiм оточуючим середовищем. В той час, як наша iнтеллiгенцiя - вченi, фiлософи, полiтики богослови - iгнорують це, Буття, яке iнтерпретують Iудаiзм, Християнство i Iслам, признають цю реальнiсть: 10 поколiнь опiсля того, як був покладений край гармонii (Раю), нашi предки майже повнiстю знищили себе (Великий Потоп). Щоб уникнути нашого самознищення ми повиннi поставити питання: чому у нас виникають конфлiкти з iншими людьми та з оточуючим середовищем? Буття говорить, що нашi предки поклали край гармонii, з'iвши заборонений плiд. Це рiвнозначно тому, щоби запитати себе:що маэ на увазi пiд собою заборонений плiд? INSONLAR ÔRGANISHI ZARUR BÔLGAN ENG MUXIM DARS. Biz insoniyatning tafakkurini evolutsiyasi xaqida ôylaganimizda kôramizki jamiyat agarda birlikda uyğunlikda yasha olmasa, bizga ôxshab, oxir oqibat ôzini xalok etadi. Texnologiya qurollarni yanada murakkablashtirib bormoqda- bugungi kunda bizda ommaviy qirğin qurollari bor- bu insoniyatning kichik qismiga katta foyizdagi resurslarni taqdim etadi. Xolbuki bu odamlar orasidagi turli guruxlar ôrtasida keskinlikni oshiradi. Bizning ziyoliylarimiz- olimlarimiz, faylasuflarimiz, siyosatshunoslarimiz, diniy ulamolarimiz- buni inkor etishsa, Ibtidoni tushuntirayotgan Yahudiylar dini, Xristian dini, Islom dini bu haqiqatni êtirof etadi: uygunlikka ( Jannatga ), chek qoyilgandan song 10 avlod ota- bobolarimiz ôs- ozlarini- vayron qilishdi( Buyuk Toshqin ). Biz ôzimizni yôq qilmasligimiz uchun, atrof muxitni vayron qilmaslik uchun, biz savol qôyishimiz kerak. Nega bizlarda konfliktlar chiqadi. Bizning ota- bobolarimiz uyqunlikga chek qôyishgan, taqiqlangan mevani yeyish bilan, biz xam shunday davom etsak bu nima bilan tamom bôlishi mumkin. Khiphảnảnhvềquátrìnhtiếnhóacủaloàingườita cóthểthấylàxãhộinàokhônghàihòanhưchúng ta sẽphảiđếnchỗtựhủydiệt.Văn minh kỹthuậtsảnxuấtvũkhímỗingàymộtthêmtinh vi – hiện nay chúng ta đãcóvũkhíhủydiệthàngloạt – vàtạođiềukiệnđểmộtphầnnhỏcủanhânloạisởhữukhốitàinguyênmỗingàymộtnhiềuhơn, do đótạonêncăngthằnggiữacácphenhómvàgiữahọvàthiênnhiên. Trong khigiớitríthức – cácnhàkhoahọc, hiềntriết, chínhtrịvàthầnhọc – lơlàvớitìnhtrạngnày, SáchSángThế (Genesis), vốnlànguồngốccủađạo Do Thái, ThiênChúavàHồi, côngnhậnhiệnthựcnày. 10 thếhệsaukhichấmdứtsựhàihòa (ThiênĐường), tổtiêncủachúng ta suýttựhủydiệt (trậnĐạiHồngThủy). Đểtránhtựhủydiệt, chúng ta phảiđặtcâuhỏitạisaochúng ta gâymâuthuẫnvớingườikhácvàvớimôitrườngcủachúng ta, vàkhiSáchSángThếnóirằngtổtiêncủachúng ta đãchấmdứtsựhàihòakhiăntráicấm, điềunàyđồngnghĩavớicâuhỏitráicấmcónghĩagì.